Facial Rejuvenation is no longer a new trend in the beauty business with women and men already becoming more open to the idea that looks really matter. Over the years, more and more technology are becoming available to save us from going under the knife too soon, and still, more and more treatments are also being developed to address every step of the aging process. With facial laser rejuvenation, w e can say that the treatment is only for those on the early signs of aging, with its non-ablative property, meaning it will not destroy the lining of the skin but will instead stimulate collagen production and work from within, the treatment will only work for those showing minimal wrinkles. It will work well with sun damaged skin by repairing it from the inside. It’s ablative counterpart, laser resurfacing works from the outside on the other hand by removing the damage top layer skin. IS LASER PHOTOREJUVENATION RIGHT FOR YOU? The ideal candidates for photo rejuvenation are those with visible and significant sun damage in the form of freckles and sunspots, those with broken blood vessels and some red lesions on the face, fine wrinkles, superficial acne scars, rough skin, enlarged pores, and minimal sagging on the jowl and brows along with marionette lines. The procedure may not work for deep acne scars, melasma, extensive wrinkles such as frown lines, and the skin growth usually on the tip of the nose. For these conditions, an ablative laser such as laser skin resurfacing or a surgical intervention like dermabrasion may be the best option. 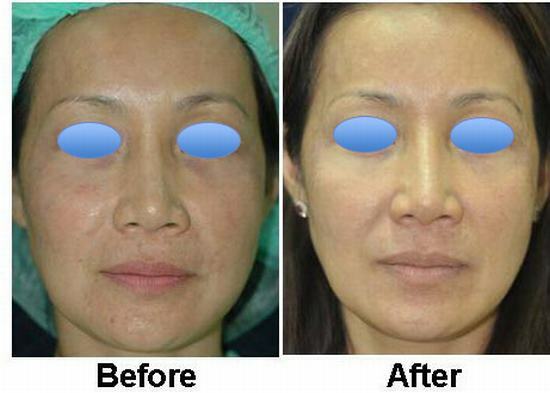 HOW DOES LASER PHOTO REJUVENATION WORK? Facial Laser Rejuvenation works by stimulating the collagen buried deep on the under layers of your skin, while gently erasing signs of aging on the top layers of the skin. The laser sends amplified pulses of light to the dermis which can cause injury. With this, the body’s natural healing process creates new and healthy tissues to replace the areas of affected tissue, thus resulting to younger looking skin. Since the epidermis is saved during the whole process, there will be very minimal chances of visible signs or marks after the treatment. The effect of the treatment may also not be as apparent at first because there is actually no change from the outside and the repair mechanism that is going on from the inside will be visible only after a few days. WHAT CAN YOU DO AFTER PHOTOREJUVENATION TREATMENT? Sun exposure is greatly discouraged after any laser treatment as it may aggravate the effect of the laser causing skin darkening in the treated areas. Patients who had done this treatment are thus encouraged to use sun screen everyday before venturing outside. Since chances of breaks in the skin is very rare, sun screen can be applied right after the procedure. The area that was treated can be washed just with water and patted dry for the first 3-5 days. Scrubbing or using harsh soap may cause skin irritation since the under layers are a little more vulnerable so they the skin will be a little more sensitive. For better result, the procedure can be done every 4 weeks to achieve the desired outcome of the patient. The final outcome of the treatment may be appreciated in about 6 months since collagen stimulation usually takes time to take visible effect. After the desired result is already achieved, a maintenance treatment may be performed at least once a year. Since there will be minimal to no damage on the epidermis, redness, swelling, and bruising happens very rarely and is usually very light so patients who had done the procedure typically suffer no downtime and can go back to work the day after the treatment. WHY SHOULD YOU DO THE PROCEDURE WITH US? At Yoskarn Clinic, we always make sure our machines are updated so you can rest assured that you can get the best treatment with us. We also provide accommodation and transportation is you need assistance in finding one as we are affiliated with Aphrodite Inn, the hotel just beside our clinic. This hotel is a recipient of Trip Advisor’s Award of Excellence for consecutive years and the staffs are all warm and friendly. The hotel is also located right at the heart of downtown Bangkok so shopping and sigh seeing will just be a few steps away. Patients who do treatment with us and stays at Yoskarn Clinic also enjoys the benefit of having our surgeons and nurses available anytime they need a consult, with our surgeon sometimes dropping by patient’s rooms for follow up visits. Facial Rejuvenation is no longer a new trend in the beauty business with women and men already becoming more open to the idea that looks really matter.